20120503 - Up, sluggish and drugged from this cold thing that kept me up most of the night. Just making through the day. Did run out for a meeting a lunch with a warehouse guy. Home and finished the day, got the main things done. Had dinner and L off to Zumba, D in his room trying to get caught up on school work, JG&I out back. I threw 2 buckets of balls to G and he hit them well. 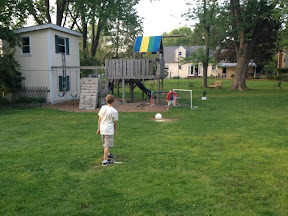 Then J&I took on G in a game of kickball. It was a good, slow, calm game. Getting dark, all in, L home. Little boys to bed. L&I up helping D with homework. Bed early, still beat down.